For those of you socially defined by current trends and tradings, who shelter behind the word ‘cool’, this recent release from Progressive Rock label Cherry Red is a deliberate provocation. 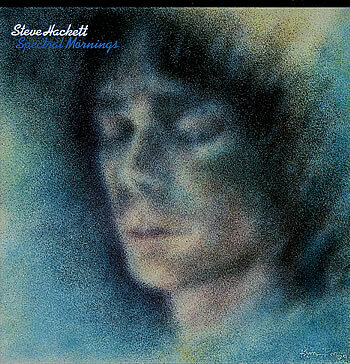 Steve Hackett’s Spectral Mornings first appeared as the title track of his third solo album in 1979. Newly released from Genesis, Hackett’s exodus into the freeworld of self expression yielded impressive results. He was as prolific as he was far ranging and the mysterious, even eastern style tinge to his signature sound was evident and epitomised on this powerful instrumental that soared with a refined and economic majesty. The piece was a major accomplishment, marking Hackett’s identity as a solo artist and showing that an instrumental could achieve the anthem-like status of the most poignant and stirring of songs. Listening to the original now, the clarity of Hackett’s guitar is a vocal in the purest sense. This 2015 version made in aid of Parkinson’s UK has been newly arranged and adapted by Hackett (guitars), Robert Reed (Piano, keyboards), Nick Beggs (Bass), Nick D’Virgilio (Drums), Peter Jones (Recorders), Chrstina Booth (vocals) and David Langdon (vocals and flute.) David Langdon has written new lyrics to the song, which make it invaluable as both a rallying cry and call for Charity. It is the kind of lyric you might imagine in your head upon first hearing the track, marrying occasionally familiar phrases with a stirring and inspiring call for ‘hope in a darkened heart.’ I believe Virginia Astley first coined this phrase in her 1986 album of the same name, but that is hardly the point. Creativity of any kind, unless it arrives from the stratosphere of the unknown Gods of Genius, is about arrangement; the finding of the correct phrase,word or image that balances the next, leading to the affects and assumptions that the best songs, books and plays exert on us. There are in the end only 8 musical notes and so these beautiful words, artfully chosen from the common heritage and matched by Langdon and Booth’s gorgeous vocals lend the song both dignity and more than a little magic. Charity singles can sometimes darken our own hearts, sacrificing musical credibility for maximum effect but this new version of Spectral Mornings stands as both a pertinent mission statement for the unfortunate Parkinson’s sufferer, as it does for all of those prone to infirmity of any kind, as well as a new set of Clothes for the Emperor. This time, said Emperor is very far from being naked. His new robes protect his reputation and inspire all of those around him to raise their own levels of presentation and his new shoes prepare the way for a brave and adventurous path, along which a cynical age can effectively embrace whichever standards it needs to attain new dignities and awareness of those whose own darknesses occasionally struggle for dawn. Spectral mornings is a 20 minute EP containing 4 versions of the song. It is beautifully arranged, played and sung and in my view resists all needs for the aimless prejudice of trends and current likings. It arrived in its amazon envelope this morning and I have already played it constantly. It tells the story of how the ghosts of ourselves can successfully people the day. There is indeed, always hope. This entry was posted on 24 September, 2015 in homepage and tagged Cherry Red Records, David Erdos, Earthly Delights and Spectral Mornings, Genesis, Prog Rock, Steve Hackett. Bookmark the permalink.